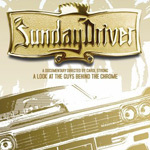 Sunday Driver is a well made film about a lowrider car club out of Compton, California, named “The Majestics.” Founded in the 1980s, its members were mostly black. This is significant both to the film and to the art of lowriding. If you know nothing about lowriding, or California custom car culture, you’re in for an education. If you thought lowriding was confined to Hispanic East L.A., you’re in for a surprise. If you are car-culture aware, you won’t be disappointed. The opening footage of vintage 60’s Chevys hopping to Dr. Dre/2Pac’s California Love is inspired and sets the tone perfectly. “...in the City... City of Compton, they keep it rockin’...”. Yes they do. Sunday Driver was produced by Rockstar Games, the people who brought us the video game Grand Theft Auto. They know their audience, who I suspect are mostly suburban white teenage males. Rockstar is a logical producer for this film but I believe there is more to Sunday Driver than just glamorizing ghetto life. It is a serious study of people (mostly black men) dedicated to their art. In this case the art is lowriding in their customized cars. It is performance art done while driving their own sculpture. So this film ought to have a wider audience than just the gamers. Making a car into a lowrider involves changing its suspension, thus allowing the car to ride so low to the ground that it’s frame drags on the street. Why, you may ask, would anyone want to do that, as it would seem to defeat the whole purpose of wheels and the car in general? The answer is for the love of style and to make a common thing into art. Sunday Driver does an admirable job of showing the seriousness with which the Majestics’ members create and display their cars. Director Carol Strong could have taken a condescending and anthropological point of view but she has not done that. Rather, the tone of the film is sympathetic and respectful. I think she recognizes that this is serious art, even if it’s not in a gallery or museum (yet). An enthusiast can be dedicated to their passion, but in the case of the Majestics, they are dedicated and also concerned about form, presentation and attention to a particular aesthetic. The fact that Strong doesn’t make that into a peculiar aesthetic is to her credit. The same equipment that lowers the car can suddenly jack it up into the air making the car anything but low-riding. Like any vital art form, lowriding is a dynamic thing, and making the cars hop is now a desirable feature. It’s all style. It’s also comic, playful, joyous and quite illegal to do on the streets. So naturally, in classic rebel-artist fashion, the Majestics hit the streets hopping. This kind of outlaw behavior is tame compared to some of the gang activity experienced by many of the original members. The leader of The Majestics is a man known as Gangster. His story makes a subtext in the history of the club. In his interviews, he says repeatedly that The Majestics are a car club not a gang. And although he was a gang member (and on his own time may still be) he insists gang life is not tolerated within the club. Other members say essentially the same thing in their interviews. My guess is that after living the dead-end life of a gangbanger, a social group like the Majestics has a lot of appeal. It has an understood aesthetic, it gets respect, and provides that satisfaction that the making of an art object gives its creator. Sadly, Gangster can’t shake his past completely, and by the end of the film he goes down in a drug bust. His last interview in the film is over the phone from prison. Another member, we are told, is serving time on an illegal weapons possession charge. These guys are not your average citizens. But the film makes it clear that all the rest of the club members continue working on their cars and seem to be dedicated to a principle that being a part of the Majestics means being someone special. After Gangster’s bust, his cars are sold (by the DEA?) but for some legal reason can only be purchased by people living outside North America (just when you thought drug laws in this country couldn’t get any stranger). This means that they are all shipped to Japan where the highest bidders revere them as works of art. (I found it curious that none of the cars went to France, where there has always been a soft spot for American exuberance.) There is also some footage shot in Japan of what has happened to the cars. Apparently, this was done after the final cut, so you will have to go to the extras to see it. I found the Japanese enthusiasm for the lowriders’ cars to be remarkable and I see another documentary here. After all, the Fast and Furious franchise has drifted into Tokyo, so why not lowriding? Elsewhere on Movie Habit, I have reviewed Who Gets to Call it Art? a film about the art scene in New York City in the 1960s and in particular Pop Art. Both films have been released as DVDs in the same month by Palm pictures, and what a great pair they make. From opposite ends of the geographic and cultural spectrums you have documentaries of American artists at work. Watch them as a double feature and get a new perspective on what it means to be an artist. The extras are mostly additional film clips and as noted above; some of that is the footage of what happens to the cars when they go to Japan. This stuff is remarkable and a must-see. It is a little sad that some of the best material is in the extras. The archival footage is understandably grainy but I had the feeling that some of the clips had been tweaked to look like home movies (?). That’s not a big deal if it’s true, but it was also not necessary. As mentioned above, the opening sequence is great, with the perfect song for the job. Elsewhere there is a scene where Gangster shows off his car to the tune of “Just My Imagination” by the Temptations... also perfect. The audio on the interviews is clear, even with the background music playing. Watch it straight through without worrying about the details and enjoy the (low) ride. Then go immediately to the Extras and watch the clips from Japan. If you want more, watch the additional interview footage and current scenes of the Majestics still rollin’.